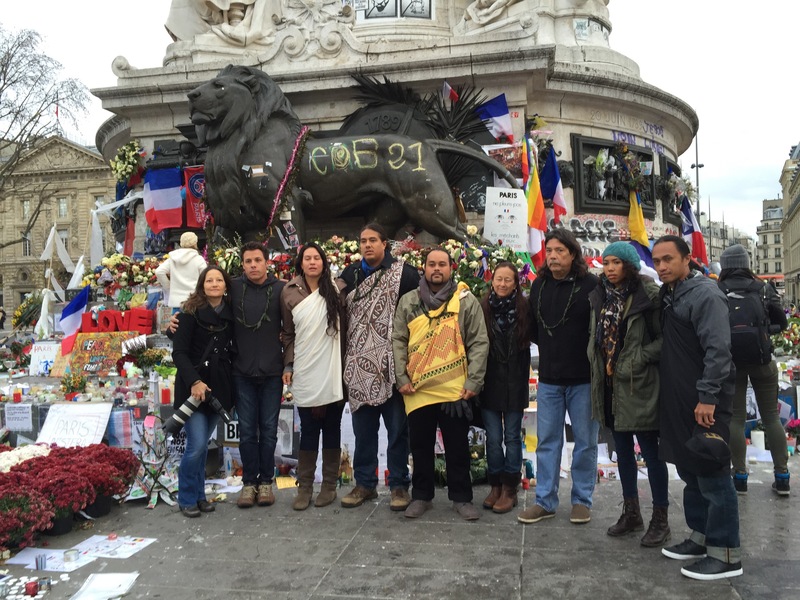 In the context of the global climate summit, the terror attack has become an excuse to cancel planned mass public demonstrations aimed at building political pressure toward meaningful action at COP21. In the context of global war-making, it has become the excuse for escalating the use of state sponsored violence to attempt to address the problem of radical jihadist terrorism. 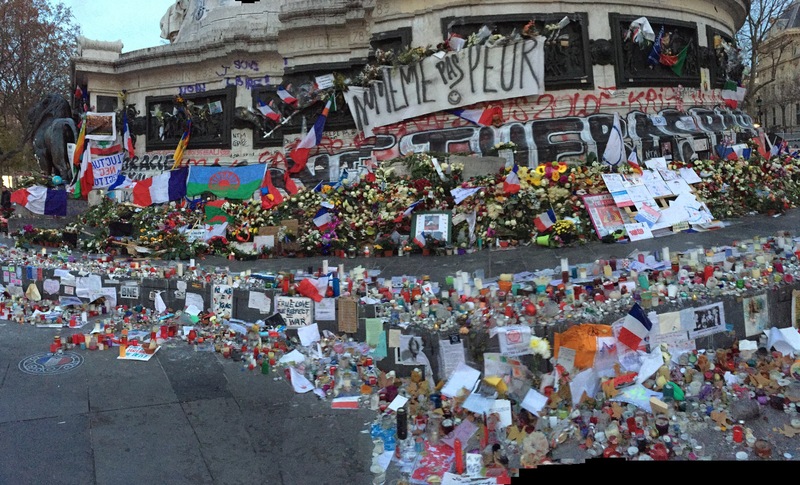 Yet on the ground here in Paris, standing in front of the monuments that have sprung up in Place de Republique, at the Bataclan Theater and on the street corner restaurants where Parisian lives were taken short weeks ago, I am struck by an overwhelmingly different response than the one echoing through the halls of governments. 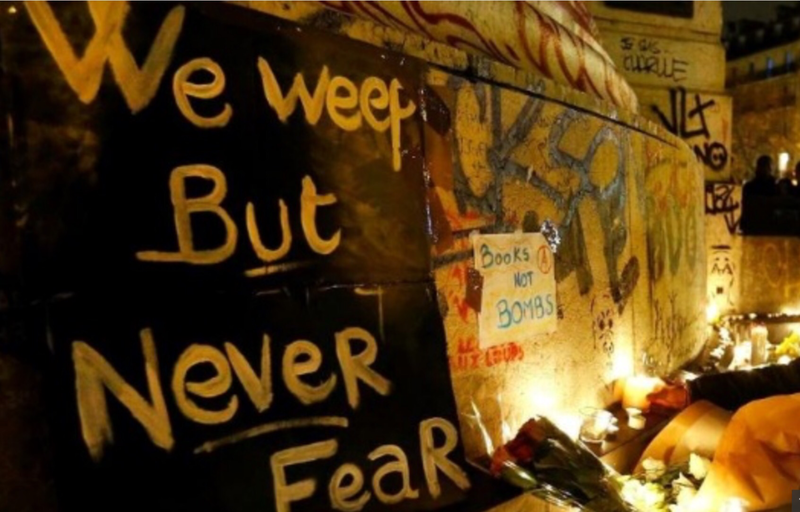 Parisians have refused to be frightened and have instead expressed their grief and sadness and anger through the medium of an overwhelming abundance of heartfelt gestures of love and peace and hope and solidarity. 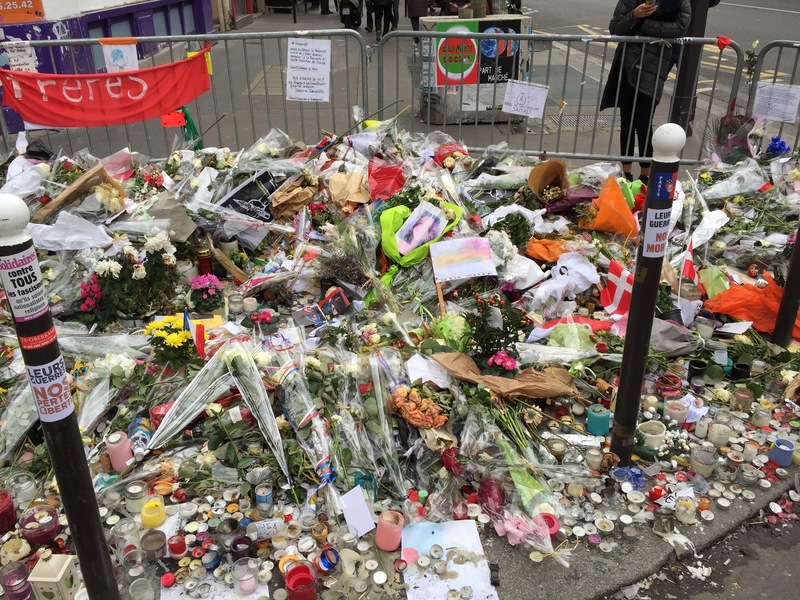 The spontaneous public monuments that have sprung up on the streets have become shrines that are both a reminder of the useless waste of violence and the deep resilience of love. Our small delegation from Maui was blessed a few days ago to be invited to be a part of this awesome generosity of spirit. 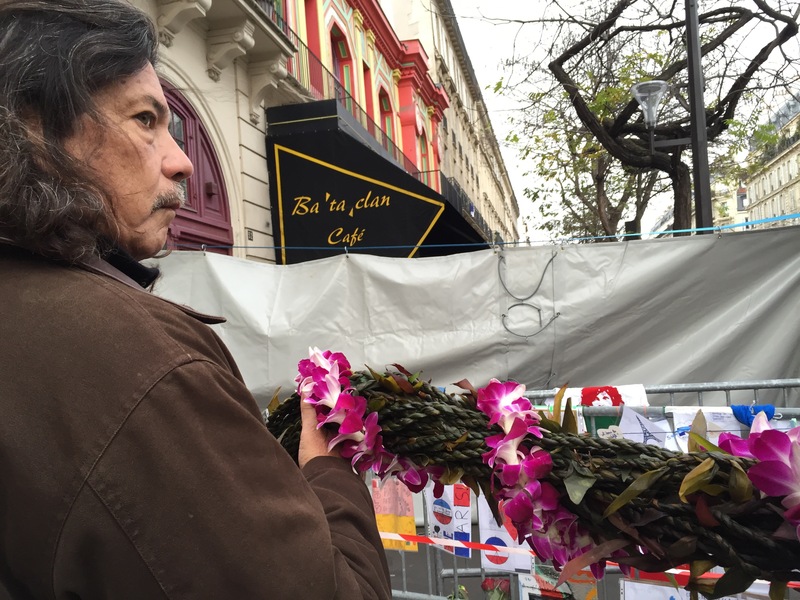 Another small delegation from our medium sized Pacific Island traveled half way across the planet to deliver a hand made ti leaf and orchid flowered lei that was a full mile in length to bring the spirit of Hawaiian aloha to Paris in solidarity with the city’s loss. This lei was crafted from a virtual forest of sacred ti leaves over four long days by hundreds of loving hands representing all of the Hawaiian Islands. It was the honor of our delegation of young leaders from Maui to present sections of this lei ceremonially, following cultural protocols, at Place de Republic on Monday morning. We then walked to several of the sites where killing took place and laid more sections of the lei at those memorial sites and murder scenes. 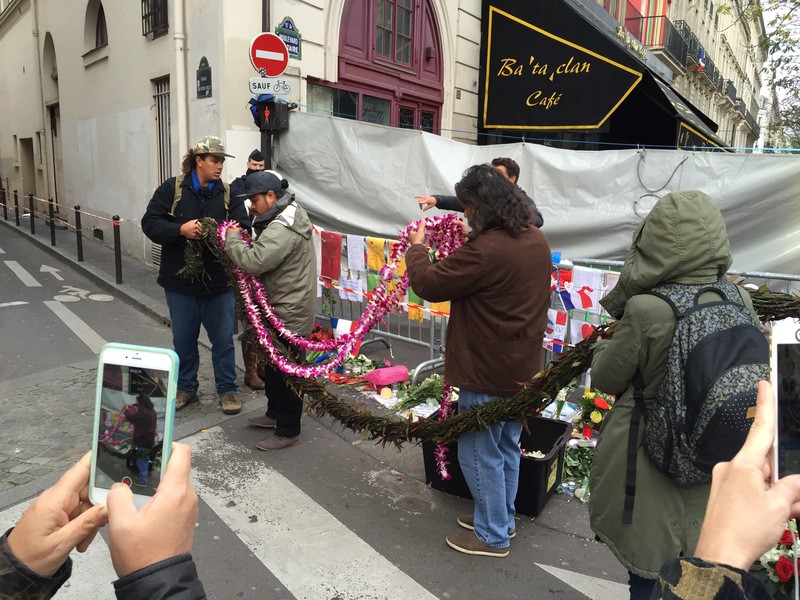 Namea played the ukulele and sang sweetly at each site. It is quite something to try to take in the reality of the lives that were taken and the waves of grief and helplessness that rippled out through family and friends and neighbors and citizens. How does one respond to such horror? I know that the rhetoric that has come from heads of state and their subsequent military directives have been to escalate the bombing and the war on IS in an effort to eradicate them in their “home territory.” How successful will this be? Mahatma Gandhi pointed out to us generations ago that violence can never be eliminated with greater violence. Is this true? It is certainly something to think about. Has the massive expression of state sponsored violence in Iraq, Afghanistan, Pakistan, Yemen and now Syria done anything other than to fan the flames of the radical jihadist movement? Are we better off now than we were two decades ago? I think not. Imagine that you live in the mountainous areas of Afghanistan and Pakistan where radical jihadist factions of “freedom fighters” have succeeded in maintaining an active presence. Imagine that almost every day you observe unmanned aircraft in the sky above your village and that you personally know grandmothers, children and non-combatant young men that have been struck down by air strikes from these unmanned aircraft, both as so-called “collateral damage” and as mistakenly targeted individuals. According to the Bureau of Investigative Journalism civilian casualties of the drone war number from 532 to 1,271 in Pakistan, Afghanistan and Yemen. * Can you imagine the intensity of helplessness, fear, rage and grief that you would feel living beneath a faceless non-human enemy day in day out for years on end? 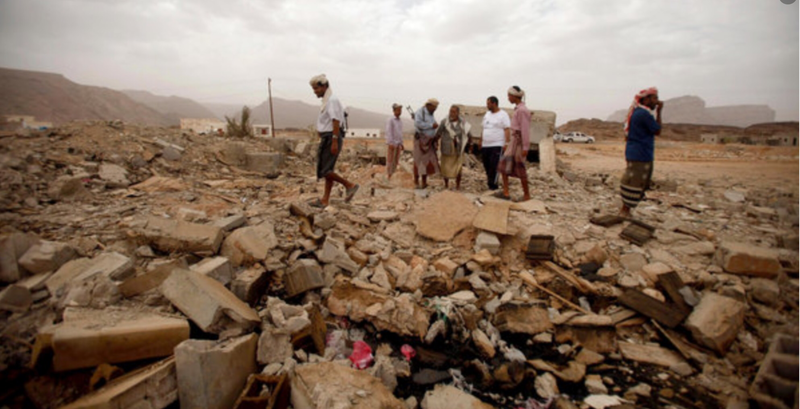 Is drone terror bringing an end to terror? Drone terror is systematic, relentless, state sponsored terrorism. 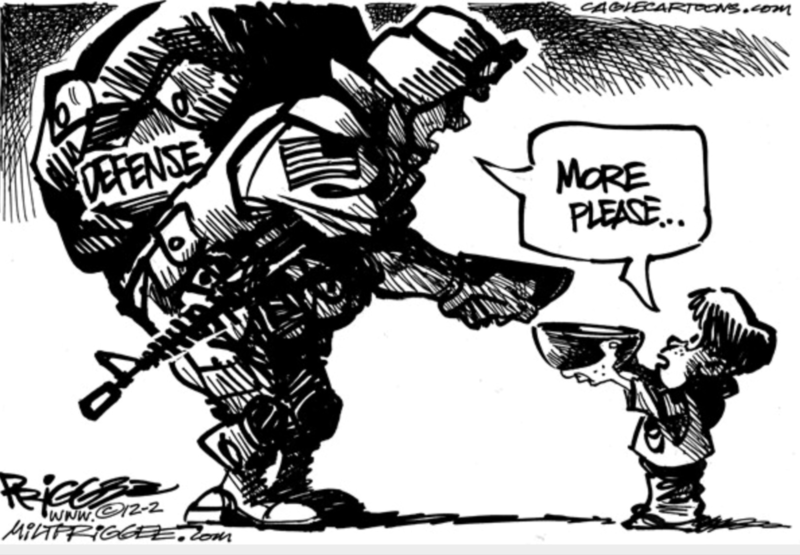 Now consider this: the United States alone plans to spend $764 billion in 2016 on its military budget. The U.S. spends an average of $14.5 million dollars a day on its fight against ISIS and 96 million every day on the war in Afghanistan. I think it is fair to say that the more wasteful a thing is of resources and energy, the more of a proportional contribution it is making to global climate change. A pretty solid argument can be made that the industry of militarization is 100% wasteful or perhaps even more. If we do go to war, all of those military resources are used to lay waste to people and infrastructure with disastrous consequences to the environment and human health. If the resources are not used for their intended purpose of death and destruction, then they were wasted on something useless with no real economic value, though it is better off for the world than if they had been used. Why is it that war and preparations for war get so little press in the global climate debate considering the outright wastefulness, toxicity and massive carbon expense of the industry? Is the notion that making war and preparing for war is a necessary solution to the problem of war something that we just have to accept as a norm? Modern warfare and modern war preparations are the most direct attack against the sanctity and health of the earth that there is. In a world that is already experiencing ecological degradation, massive poverty and hunger, to squander valuable resources on a war industry is violent in itself. It robs from the poor and the planet on one side and destroys life support systems on the other. It is a crime against the planet and humanity. Perhaps this perspective gets so little air time because no one knows what to do about the problem except grieve and pray. Some few of us have refused to pay taxes. And we have taken to the streets in protest, seemingly to little avail. Not knowing what to do is not an excuse for not facing the truth of a thing and asking powerful questions of ourselves and of the powers that be. The thought structure and cultural habits that rationalize a massive global war industry is the same thought structure that rationalizes postponing the environmental and social costs of mass extraction, production and consumption for as long as possible, thus our global climate crisis. We are caught in the climax of a genuine paradigm conflict. A new paradigm of economics, politics and culture is rising up as a visionary force out of the multiple crises threatening global catastrophe. Meanwhile the conventional paradigm is one in which class stratified consumer societies, nations, mega-corporations and billionaire individuals compete with one another at conquest and expansion on a finite globe. The old paradigm has resources and inertia on its side. The emerging paradigm has vision, truth, human heart and hope. When the horrible consequences of the old paradigm come home to us as a devastating typhoon, an inescapable drought, a drone strike that kills a child or a senseless terrorist attack in the city of love, sometimes all we can do in the moment is give our hearts the space to feel, give our hands another hand to hold and light a candle for the future that it be not so. At these times we need to remind ourselves and one another of what we care for and trust in our ability and our will to act, even when the path forward is momentarily blurred by our tears.